Miro 3 is released! For starters, Miro is widely popular open source internet television application. 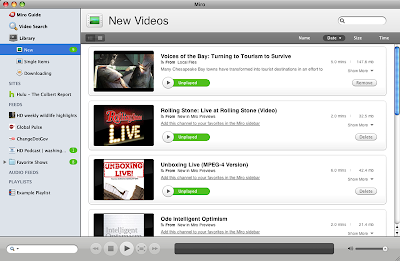 Miro can automatically download videos from RSS-based channels, manage them and play them. Miro integrates an RSS aggregator, a BitTorrent client (based on libtorrent), and a media player. Subtitles: If subtitles are embedded or in the same folder as your video, they will be available automatically in a new drop-down menu. Or pick any subtitle file. Even Faster: Miro is faster and snappier in all sorts of ways from downloading torrents to deleting lots of files. Louder: The maximum volume for videos is now at least twice as high. Really nice for laptops. Now, let's see how to install Miro 3 in Ubuntu. Goto System - Administration - Software Sources and select Other Software tab. Now, click the Add button. Now, depending on the version of Ubuntu you use, copy-paste the following line. Done. Save and exit and click Reload when prompted. Open Terminal(Applications - Accessories - Terminal) and copy paste the following lines. OR simply goto Synaptic Package Manager(System - Administration - Synaptic Package Manager) and search for the package Miro. You might want to check out Songbird and XBMC as well.